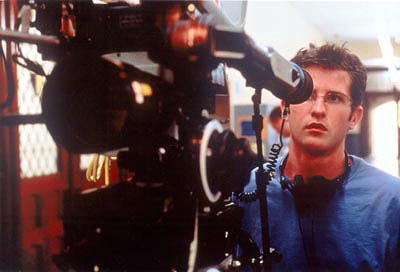 Some industry news about Cinecultist's favorite filmmaker to objectify, Richard Kelly (He's 29! He went to USC Film School! His favorite movies are Road Warrior and Empire Strikes Back! He's like a real life Dawson Leary!). New York magazine reports Richard is "teaming up with director Tony Scott on a new film called Domino." Keira Knightley will "star as Domino Harvey, the Ford model and daughter of original Manchurian Candidate star Laurence Harvey, who made headlines by rejecting her luxurious life to become a bounty hunter. Shooting starts this fall." Keira as a bounty hunter? Brilliant! Will she get to kick down doors in skimpy clothes yelling obscenities at brutish fleeing cons? Consider us so there.